Following World War II, America’s nuclear capability rested with the Boeing B-47 Stratojet—a high-speed precursor to the modern jet airliner. The surprisingly capable strategic bomber carried out nuclear testing responsibilities early in the Cold War, including an absurd vertical looping maneuver to deliver its atomic payload. It was like a stunt you’d pull off in a flight simulator, only it was official protocol for testing nuclear payload deliveries. In the video below, titled “Low Altitude Bombing System,” or LABS, was a vertical looping maneuver used by B-47 pilots to deliver nuclear payloads to testing sites, and if the Cold War ever escalated, Russian targets. The maneuver required the pilots to go into a vertical looping trajectory. Essentially, as the plane began to loop and the nose began tilting back towards the ground, the nuclear payload would be released. The stalled delivery of the bomb allowed the pilots to loop the B-47 until it was upside down and pointed in the opposite direction of the imminent explosion. The plane would roll back over and continue on an inverted path from the bomb site. The stunt put excessive G-forces on the airframe and crew, and despite the additional time and distanced the move gained, it wasn’t quite enough to outpace a nuclear blast. 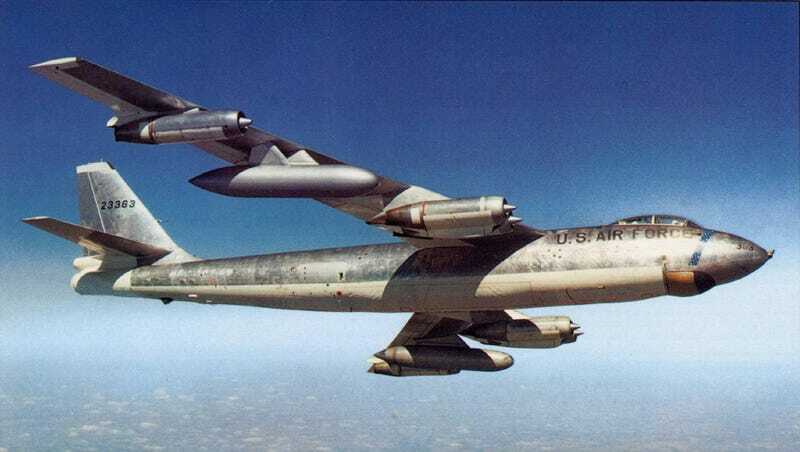 Ultimately the exercise was never needed in battle during the Cold War, and the B-47 would go on to retire in the ‘70s without ever delivering a payload in combat.